The Accreditation Council for Graduate Medical Education (ACGME) requires residency programs to prepare residents to teach and assess medical students and other learners. In order to achieve this, many programs develop formal residents as teachers (RAT) curricula. Medical educators may seek the guidance of previously published literature during the development of RAT programs at their institutions.The authors sought to identify key articles published on the subject of RAT programs over the last 10 years. The authors utilized a formal literature search with the help of a medical librarian and identified additional articles from virtual discussions among the author group and an open call for articles on Twitter using the hashtag #MedEd. Virtual discussions occurred within an online community of practice, the Academic Life in Emergency Medicine (ALiEM) Faculty Incubator. The lead author conducted a four-round modified Delphi process among the author group in order to narrow the broad article list to five key articles on RAT programs. The authors summarize each article and provide considerations for junior faculty as well as faculty developers.Curriculum development and program evaluation should utilize established frameworks and evidence-based approaches. The papers identified by this Delphi process will help faculty use best practices when creating or revising new RAT curriculum. In addition, faculty tasked with guiding junior faculty in this process or creating faculty development programs around curriculum development will find these articles to be a great resource for building content. A systematic review of resident-as-teacher programmes. Residents in all disciplines serve as clinical teachers for medical students. Since the 1970s, there has been increasing evidence to demonstrate that residents wish to teach and that they respond positively to formal teacher training. Effective resident-as-teacher (RaT) programmes have resulted in improved resident teaching skills. Current evidence, however, is not clear about the specific features of an effective RaT programme. This study was performed in order to investigate the effectiveness of RaT programmes on resident teaching abilities and to identify the features that ensure success. Methods of assessment used to ascertain the effectiveness of RaT programmes are also explored. The literature search covered the period between 1971 and 2008. 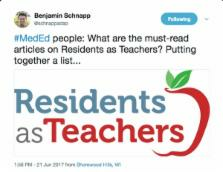 Articles focusing on improving resident teaching skills were included. Each study was reviewed by two reviewers and data were collected using a standard abstraction summary sheet. Study outcomes were graded according to a modified Kirkpatrick's model of educational outcomes. Twenty-nine studies met review inclusion criteria. Interventions included workshops, seminars, lectures and teaching retreats. Twenty-six studies used a pre- and post-intervention outcome comparison method. Subjective outcome measures included resident self-evaluation of teaching skills or evaluation by medical students, peers and faculty members. Objective outcome measures included written tests, evaluation of teaching performance by independent raters and utilisation of objective structured teaching examinations. One study objectively measured learning outcomes at the level of medical students, utilising the results of an objective structured clinical examination. Overall resident satisfaction with RaT programmes was high. Participants reported positive changes in attitudes towards teaching. Participant knowledge of educational principles improved. Study methodologies allowed for significant risks of bias. More rigorous study designs and the use of objective outcome measures are needed to ascertain the true effectiveness of RaT programmes. Future research should focus on determining the impact of RaT programmes on learning achievement at the level of medical students. Copyright statement: Copyright © 2018, Krzyzaniak et al. Developing an ethics curriculum for a family practice residency. Innovative "Case-Based Integrated Teaching" in an undergraduate medical curriculum: development and teachers' and students' responses. Quality Education and Safe Systems Training (QuESST): Development and Assessment of a Comprehensive Cross-Disciplinary Resident Quality and Patient Safety Curriculum.